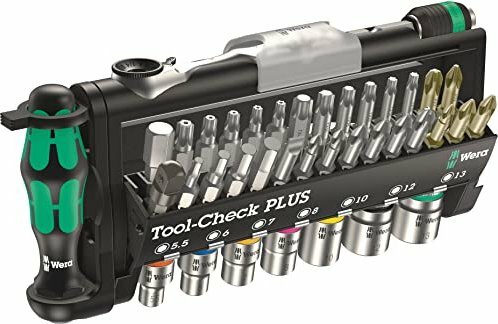 Wera 39 Piece 1/4" Drive Tool Check Plus Bit & Socket Set 1/4"
Wera bit-Check 30 Impaktor 1 bit set, 30-piece. Makita quick screwdriver 6mm Drills-/bit set, 2-piece. Wera Red Bull Racing Cyclops Speed 8001SA6 bit set/wrench set 1/4", 28-piece. Makita SDS-plus Drills-/chisel set, 17-piece. Bosch bit set/wrench set, 46-piece. Bosch bit set/wrench set, 27-piece. Mannesmann M98430 bit set/wrench set 1/4" 3/8" 1/2", 215-piece. Wera Cyclops Metal 8001SA7 bit set/wrench set 1/4", 28-piece. Gedore D 30 KMU-20 bit set/wrench set 3/8", 40-piece.